This lovely Pomelo salad is so easy to make. As with most Thai dishes, the preparation takes longer than cooking or in the case of this salad mixing everything together. 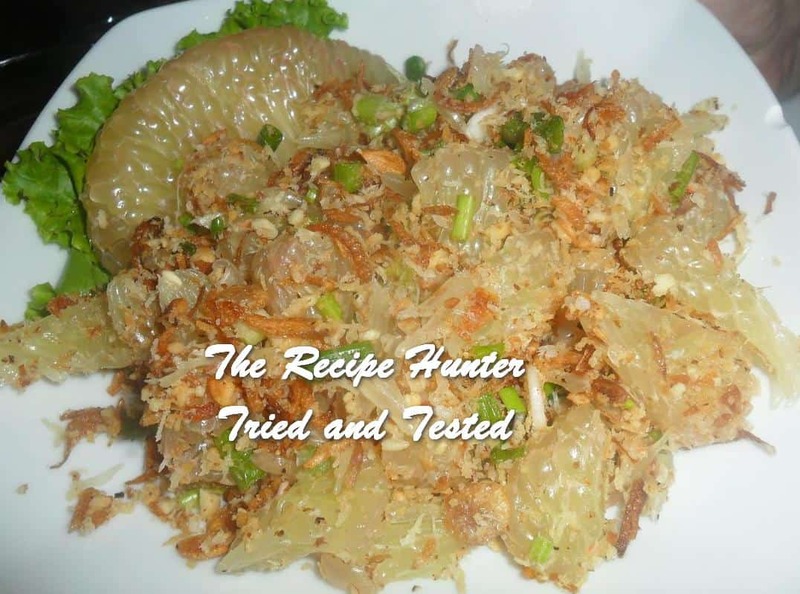 Pomelo Salad or as it is known here “Yum Som O” is a wonderful light refreshing salad made with Thai Grapefruit (Pink Grapefruit) can be substituted and there is very little difference in flavour. 1-2 red chillies finely sliced. Set a pot of water to boil on the stove. Add shrimp and boil just a few minutes, until shrimp turns pink and plump and firm to the touch. Place shredded coconut in a dry frying pan or wok over medium-high heat and stir until coconut turns light golden brown and fragrant. Tip coconut into a small bowl to cool and set aside.Repeat with shallots frying in a little oil until golden and crispy tip into small bowl and set aside to cool. Prepare your grapefruit or pomelo, removing as much of the white peel as possible from the fruit. Break into bite-size pieces or shred completely which is my preference – 3 to 4 cups is sufficient. Put prepared fruit in a salad bowl. Add cucumber, basil/mint, coriander, and fresh chilli to Pomelo. Then combine all dressing ingredients together in a small jug, stirring well to dissolve the sugar. Add shrimp to the salad bowl, then pour over the dressing. Add most of the toasted coconut,shallots and nuts, reserving a little for garnishing, then toss again. TASTE-test the salad for a balance of sweet/sour/spicy/salty. Adjust to your liking, adding more sugar if too sour. For more depth of flavor, add a little Fish Sauce. Your salad is now ready to serve. Top with reserved coconut,nuts and shredded lime leaf, and ENJOY! Tip: Like most Thai salad dressings, this is an oil-free dressing, so it doesn’t appear to ‘cling’ as well as oil-based dressings, naturally collecting at the bottom of your salad bowl. This isn’t a problem – just be sure to toss a little more than you would for a regular salad in order to saturate ingredients with the dressing. This salad is better served and eaten immediately, the fresher the better. If preparing for a party, keep the dressing apart from the salad until you’re ready to eat, then toss them together just before serving. I do hope you enjoy as this is one of my favourite salads. I do shred my Pomelo much finer though rather than having it too chunky. But as with anything, it is personal preference.